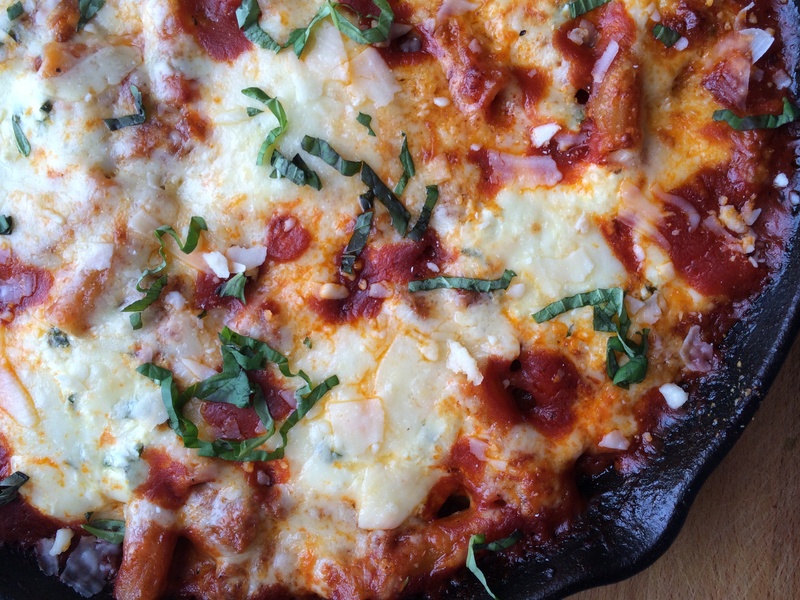 Full disclosure: I did not use ziti to make this baked ziti. I used rigatoni. It’s what I had on hand and “baked rigatoni” just doesn’t have the same ring. This recipe has “feel good food” written all over it. 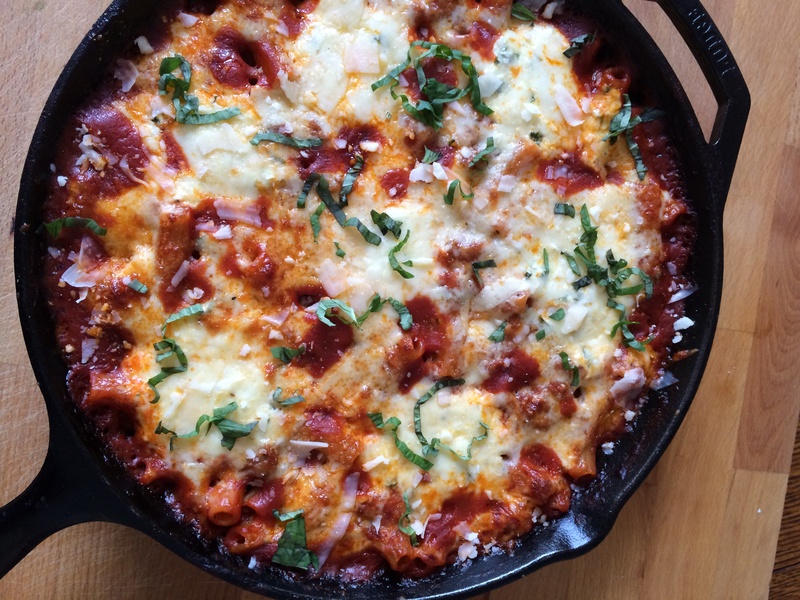 Italian sausage, tomato sauce, pasta, ricotta, mozzarella and parmesan cheeses, fresh basil and loads of garlic … a hybrid of baked ziti and lasagna. FEEL. GOOD. FOOD. At it’s best! The uniqueness of this dish is that it cooks in one pan. Even the noodles! No need to pre cook before adding them to the sauce. Con-veeee-nient!!! 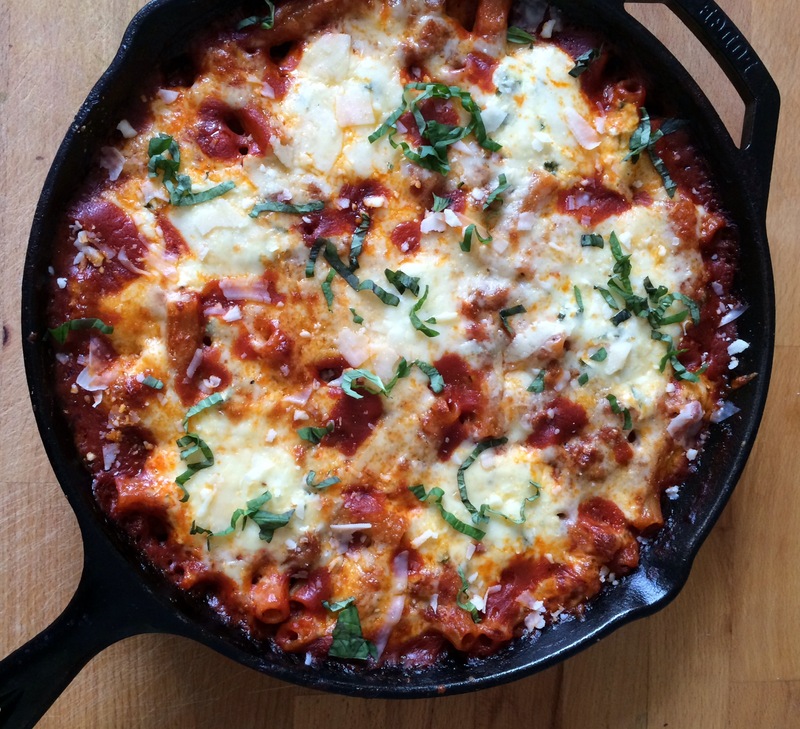 I like to make this dish in a 12-inch cast iron skillet. It can go directly from stove top, to oven, to dining room table. It also makes for a beautiful presentation. If you don’t have a cast iron skillet, not to worry. Any 12-inch oven-safe skillet will work. I was a little skeptical the first time I cooked pasta directly in the skillet, but this dish turned out to be a true winner. 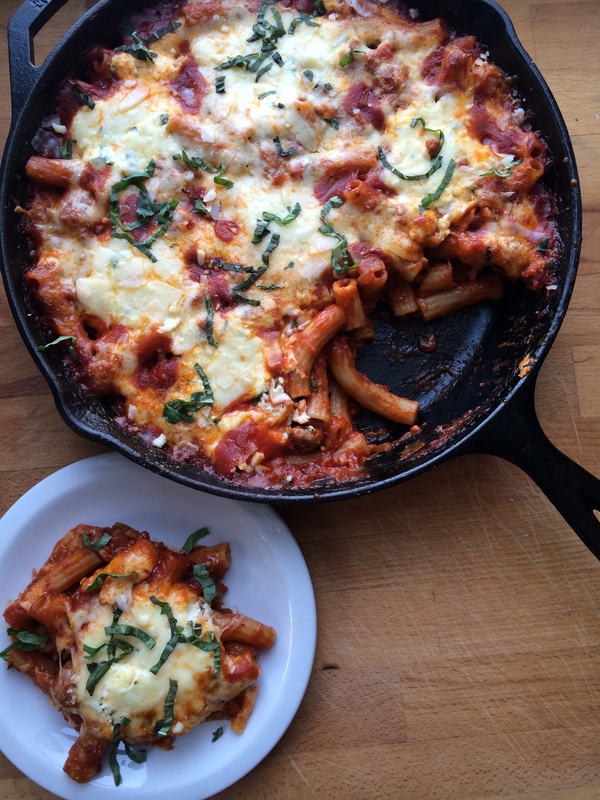 I’ve been making ziti this way ever since. One pointer, stir the pasta frequently while it cooks to keep it from sticking to the bottom of the pan. This tastes even better than it looks, and that’s saying a lot. Heat a 12-inch oven-safe skillet to medium-low heat (I prefer cast iron). Add olive oil, onion, and garlic, and cook for 10-12 minutes until translucent. Increase heat to medium and add the sausage. Cook until no longer pink, about 8 minutes, breaking up any large pieces with a wooden spoon. Stir in the strained tomatoes, red pepper flakes, dried Italian seasoning, 1/2 teaspoon of salt, and 1/4 tsp pepper. Gently simmer for 15-20 minutes, stirring frequently. Add water and rigatoni and stir to combine. Increase the heat to high and cook at a vigorous simmer, stirring frequently for 15-20 minutes, until the pasta is just tender. (Note: You may have to drop the heat back to medium to maintain the simmer.) Stir the pasta frequently to keep it from sticking to the bottom of the pan. Meanwhile, prepare the cheese mixture. Combine ricotta cheese, egg, 1 cup mozzarella cheese, ¼ cup parmesan cheese, 2 tbsp fresh basil, and a pinch of salt and pepper. When the pasta is just tender, stir one final time leveling out the pasta and sauce, and turn off the heat. Dollop 8 large spoonfuls of the cheese mixture throughout the skillet. Gently nestle dollops of cheese into the pasta. Add the remaining 1 cup mozzarella cheese and 1/2 cup of parmesan over the top and transfer to the oven. Bake for 15 minutes until the cheese has melted and sauce is bubbling. Allow dish to rest for 10 minutes, then sprinkle with the remaining fresh basil. 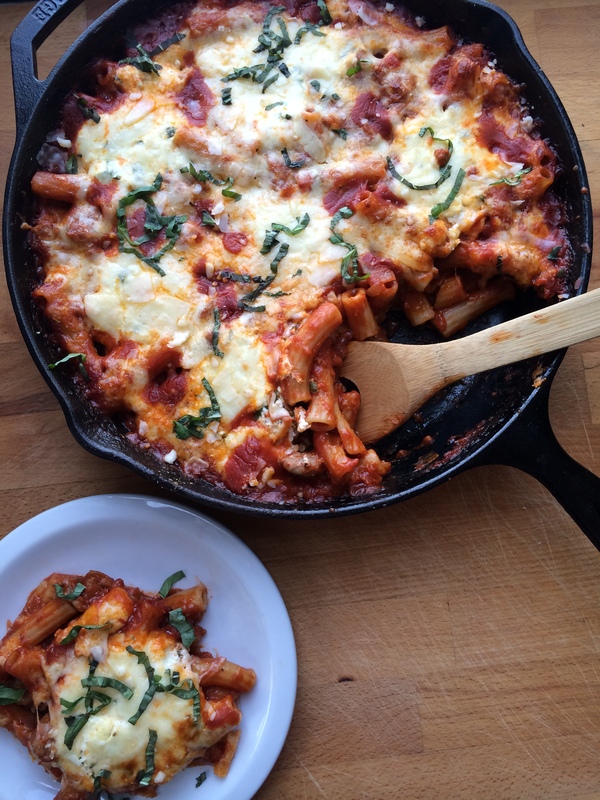 Serve warm with additional fresh basil and extra parmesan cheese. Note: The tomatoes for this post were gifted to me from Pomi USA Inc. Pomi tomatoes are 100% Italian garden-ripe tomatoes processed immediately after harvesting. They are 100% natural and fresh tasting, and are BPA and GMO free. They have no preservatives, no water added, and no citric acid. Pomi tomatoes are a pantry staple of mine. This looks amazing! And I love the one-skillet idea. Great post, Emily.